Mobility aids for senior dogs are super useful tools for your much loved furry friend. In this article, I am going to show you how you can use these 10 powerful tools to significantly improve the quality of life of your senior dog. These dog mobility aids are not just for senior dogs because they can be used for any dog when they have a special need. For example, when they have surgery or if they are suffering from a health issue. So please do explore them and give your dog a very special gift and transform their life style. Just as in humans the effects of aging on a dog are inevitable. Arthritis, ligament injury, joint pain, muscle loss, degraded vision, etc. are some of the many problems that are experienced by a dog who is at his ripe old age. Sure, you can carry around small dogs, that too to some extent. But it is not a viable option if you have a bulky breed. That is when it’s time to get mobility aids for senior dogs that can help your canine to move around in a safe and comfy manner. So, let us take a look at some of the best mobility aids for senior dogs and how they are useful for your aged pets. Carrying dogs in strollers might seem a little amusing at first, but once you realize the benefits offered by a stroller you will never look back! From providing sun protection to a great deal of ease in carrying around your pet, dog strollers have come a long way. But when it comes to actually making a purchase there are certain factors the buyers should always keep in mind. To ease out your difficulties we have prepared a list of pros and cons of using a dog stroller that will help you make a firm decision. Dog strollers are a boon for aged dogs. Since the joints of your dog tend to become week as he ages, it is not possible to keep him as active as before. But it is also unfair to leave him behind during the fun time! After all, he has been a member of your family throughout. A dog stroller enables your senior dog to comfortably move around and have a nice time. Just as a senior dog should be a part of all your fun activities an injured dog shouldn’t suffer alone either. It is important to provide some quality outdoor time to injured dogs as they recover. Be it a family outing or a trip to the vet, pet strollers make them easier for both the dog and the owner. In areas where there is a lot of traffic, say Manhattan streets, a pet stroller can prove to be of great convenience. It keeps your dog in his own comfort zone and avoids issues such as social anxiety to develop. It is important that you use a pet stroller only when it is required or it can result in a lot of disadvantages. A pet stroller, if used excessively without need can induce sedentary behavior in your pet and make him lazy. It is important to socialize your dog with his fellow canine buddies. A dog stroller might act as a physical barrier and cause your dog to become less socially active. Traveling with your canine buddy without any hassles sure sounds like fun! With the right accessories, you can make this dream come true. Humans have access to various essentials such as helmets, gear, etc for bike riding. So why not make some essentials available for your faithful companion as well? Regardless of the terrain, a dog bike carrier is an equipment that lets you enjoy a ride with your dog. Also, people bringing dogs wherever they go is an increasingly popular trend nowadays. So, if you wish to get some of the adorable tail-wagging action, take a look at the details of how a dog bike carrier can be your pooch’s new friend. In heavily populated areas it is safer to use a dog bike carrier for traveling with your dog. This way your pet has it’s own comfort zone that prevents anxiety in difficult social situations such as overcrowded seats. Although most people seem to think that dog bike carriers don’t offer much space, in reality, they are one of the most comfortable mobility aids for senior dogs as well as for other pets. If you purchase the correct size then you can end up with a really good and a well-ventilated space for your dog. If you are thinking that a dog bike carrier will just add to stuff in your home then you are probably wrong. Most of these bikes available in the market are adjustable and can be folded to save space in your home. A dog bike is not meant for owners who are rash drivers. You have to be extra careful when you are traveling with your pet. You can’t use a collar while using a dog bike carrier. Always use a harness as too much pulling on the collar can cause damage to your dog’s neck. Dog ramps play an important role is you are trying to decide on the best mobility aids for senior dogs. Sometimes due to age, weight or illness, your pet might face difficulties in everyday actions such as climbing up stairs, vehicles, or on to a bed. A pet ramp is one of those mobility aids for senior dogs that takes off stress to a certain extent, thus, aiding in ease of mobility. In addition to using a dog ramp for getting your dog out of vehicles like SUVs and similar vehicles, it can be used for getting your dog into a bathtub. One other great use for a dog ramp is for a grooming table. It is not safe for a dog to jump out of vehicles or even climb short flights of stairs on a snow-covered surface. Better be safe than sorry. When your dog is recovering from an injury, it is better to take some extra precautions. Instead of letting your dog leap abruptly from vehicles or climb up and down the stairs, use a dog ramp until he fully recovers. Wooden ramps can retain moisture that can prove to be dangerous for your dog. They can also rot over time which is a waste of money. A ramp too steep can do more damage than help. So, make sure you check this out before making a purchase. Having the right kind of dog harness helps in gaining more control of your dog’s movements. Apart from this, a harness has another use and that is to aid in the movement of senior dogs. Harnesses are among one of the best mobility aids for senior dogs. Dogs can easily adjust to them and harnesses are much better than the traditional leashes if you are looking forward to providing more comfort to your senior dog. Harnesses are easy to wear and they provide the desired comfort. They do not cause tangles in front of the dog, thus, eliminating the risk of tripping. As dogs grow older their joints start to wear. The neck joint becomes weaker and more sensitive to pressure. In such cases, a dog harness can act as one of the best mobility aids for senior dogs as it does not create a pulling action and keeps your dog safe. It also eliminates the risk of damage to your dog’s bones. A harness is also effective in preventing tracheal injuries to a dog, especially if your pet is prone to tugging and pulling. A harness provides a better control over the dog. This means that you can protect your pet in a better way. Even though a harness is better than a collar in most ways, it is important to be careful while using it or you may risk injuring your dog. It doesn’t offer much control if your pet has behavioral issues and is not well-trained. If your dog is facing any trouble during walking a sling is another one of the amazing mobility aids for senior dogs that can prove to be effective in increasing your pet’s comfort level. There are many different types of dog support slings available. You can choose one that seems most appropriate for your dog. A sling is one of the best mobility aids for senior dogs and for pets who are recovering from an injury or surgery. It takes the pressure off while walking and eases out the pain. A dog support sling can prove to be fatal if you don’t take into account the size of your dog before making a purchase. The wrong sling can generate extra pressure and can cause severe bone or muscle damage. Unless you own a breed that is well adapted to the weather conditions of your region it is a good idea to invest in a dog support vest. It is also one of the best mobility aids for senior dogs. No matter what, your pets love you. Don’t you think for all this canine love they deserve some extra care? A vest calms a dog if he is becoming a little overactive. Vests are known to instigate a feeling of security in your dog, more like a hug from their beloved owners! So, with age, if your dog becomes prone to anxiety, a dog support vest helps in calming him down. Can you imagine stepping out of your house on a snowy day without your jacket? No, right? Then there is no reason why your dog shouldn’t be in a weather-appropriate attire. A vest protects your dog from the harsh weather and keeps him warm and comfortable. Do not, under any circumstances use a weighted vest on a senior dog. They can cause more damage than good for your pet as the extra weight can damage their weakened bones and joints. With time and age, most of the dogs lose their ability to walk around or leap as lively as they used to when they were young. Once your pooch reaches a certain age, long walks become a thing of the past. But that doesn’t give you the right to deprive your canine buddy of his much-needed fun time. In order to enable your dog to enjoy the kind of lifestyle he once used to, you have to step up and offer him what he needs to restore his enjoyment. Dog support back legs are some of the best mobility aids for senior dogs that are quite handy for the owners too. If you’re a dog parent, you know how heartbreaking it is to see your dog stumble and fall. To acknowledge the fact that your dog is getting older is hard as it is. By this time, you know that it’s impossible to escape from the inevitable. All you can do is make it all easier on your dog by providing him all the support you can. There are many reasons why you should consider using a support for your dog’s rear legs. Let’s take a look at some of the reasons why. If your dog is in his recovery phase from a previous injury, it is not a good idea to leave it as it is even post-treatment. In order to facilitate ease of movements, you should definitely provide some extra care and support so that your dog can get back to normal as soon as possible. When a dog ages it is natural for the bones to get brittle and joints to weaken. Your pet will start showing signs of arthritis from the day aging begins. You just have to be vigilant enough to notice them. Do not wait too long to use a support as it increases the chances of injury to your dog. If your senior dog has developed degenerative diseases then merely using supports won’t be enough. Take some additional measures such as carpeting the floors and having special accommodation for a senior dog. These extra steps will enable you to keep your dog more comfortable. One of the most common reasons for you to opt for dog support back legs is hip dysplasia. In this condition, the degeneration of the ball and socket joints of the hip begins to take place. Hip dysplasia mostly affects dogs of a larger breed. Even though the benefits of dog support back legs are immense for aged dogs, you need to make sure that you purchase one according to the size of your pet. For example, a regular sling will suffice for a small dog but a bulky breed will need a real sturdy one. Keeping your dog who has been suffering from a back pain happy is sure a task. Dog brace supports are specially designed to give your dog a firm and a comfortable back support. It helps to balance out the spinal column and stops any unwanted movement which might exaggerate any medical condition that the dog might be facing. All in all, a dog back support brace is one of the best mobility aids for senior dogs available in the market. Dog Back Support Brace are a boon for dogs that are overweight. As overweight dogs have a huge strain on their neck and their knees, it is difficult for them to move around. By using a support brace your dog will have an extra support for the back which will make basic movements easier. Dogs who are suffering from a medical condition like Intervertebral Disc Disease can really be benefited from the extra support, specially during activities like walking or while going on a hike. It also lessens the pain by giving a light pressure on the nervous system, which relaxes and has a calming effect. A back support brace has to be the right size and quality as dogs are not able to communicate whether they can tolerate wearing it or if they will get used to wearing it. If it at all seems that your pet is not comfortable, it is better to remove it or this might increase pain in your dog’s back. It is important that you use a Back Support Brace that is the right fit or it may lead to many inevitable problems. When you have a pet dog that is handicapped, or recently met with an accident or might be having some kind of injury, even the slightest movement can cause pain. A dog wheelchair is one of those mobility aids for senior dogs that aids easy movement and thus keeps your pooch happy. Dog wheelchairs enable your dog to lead an active life and travelling with them also becomes easier. 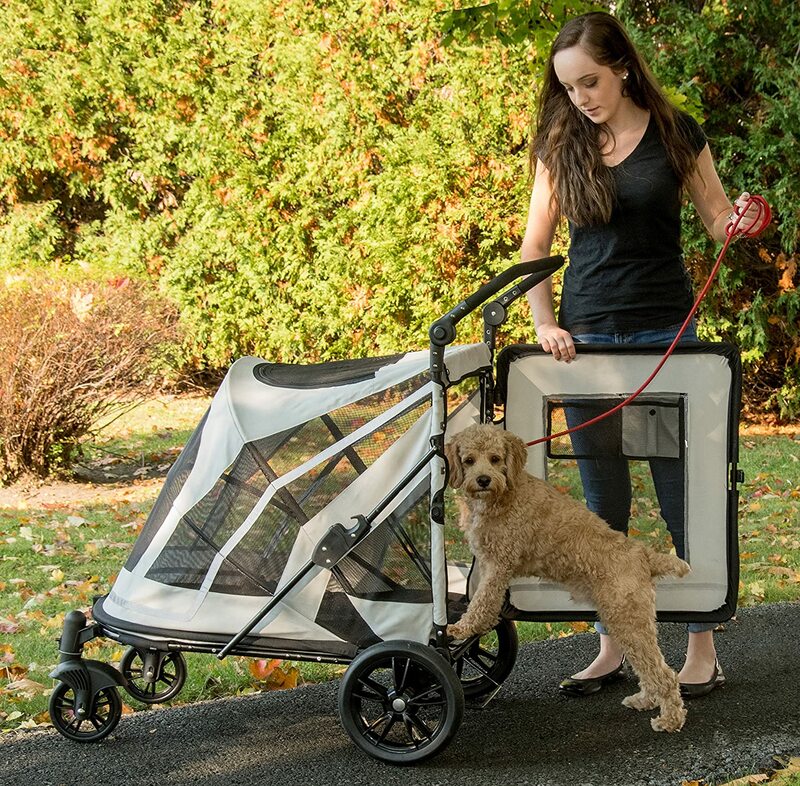 It is lightweight and has an adjustable frame that can fit your dog perfectly! These are specially designed by vet orthopedic surgeons. A good quality dog wheelchair usually comes with a lifetime warranty making it a worthwhile investment. In cases of chronic illness or if your dog is handicapped, a dog wheelchair acts as a life saver as it enables your pet to move freely without any difficulty. Most of the people think that dog wheelchairs are not comfortable as they don’t give much space but in reality these are very lightweight and comfortable for the dogs. They come with a frame that can be easily adjusted to your dog’s perfect fit and liking. It also comes with a ski attachment so you can not only use it in summers but in winters as well. This helps your dog to move around the place in all kinds of weather without a problem. The only con one can think of is they might be a bit on the expensive side, although, they are a one time investment as they are super durable. Dog step stools are very lightweight and can be used in almost any part of your house. These are not very expensive and can help your dog to safely move up or down from various furnishings without getting hurt or any difficulty. It is very light in weight and doesn’t take up much space in your house or apartment. This becomes a huge advantage over the traditional pet ramps that require way more space to store and place than Step stools. Since it is lightweight it becomes so much easier for you to handle. You can quickly set it up as and when needed. It is not safe for a dog to move on furnishing and surfaces that are slippery. When it comes to Step stools you can choose from a variety of step stools. Opt for one with a sturdy surface that doesn’t get slippery even when wet. This enables firm gripping and keeps the dog safe from any kind of injury. As step stools are very light in weight there is a chance for them to slip if used on very slippery surfaces like tiles, marbles, etc. They need to be placed properly on a mat or a carpet in order to avoid any unfortunate incident. Your pet’s age or the status of his health should never become a reason for the impairment of his mobility. Just because your dog’s body is growing old doesn’t mean that his will to exercise and an active mind have aged as well. Even though as pet parents we don’t want to hear this, our dogs age with time, and they need additional support and care. So, leave no stone unturned to make each moment count and make it enjoyable for you as well as your pet. Take them on walks and use a stroller when required. Take them on hikes and adventures with you. If you love biking enjoy the great outdoors because you can use a bike trailer. Let these mobility aids for senior dogs do their work while you are out giving your buddy the best possible time. If you found the article useful please do share it with your friends and your family. 1) Caring for your dogs is very essential – this is a nice repository of related articles. 4) Caring for old dogs – 7 habits. 6) Senior Pet Care – A good article with comparison tables.